Chinese Crested Dog is an old breed, and as is so often the case, its history has been lost over time. Some experts feel the breed most likely descended from hairless dogs in Africa, with the Chinese developing the smaller version of the breed. Pictures created in the 1500s and 1600s show Chinese Cresteds involved in Chinese life. Chinese sailors kept the dogs aboard ship as vermin hunters and, in doing so, spread the dogs to ports throughout the world. They were known as Chinese Sailor Dogs, and many of the small dogs were used for barter. The dogs were especially prized during times of the plague, as the hairless skin didn’t harbor fleas. The breed was also known as the Chinese Edible Dog, which can give you a clue as to the breed’s other purpose in China. The Chinese Crested is found in two varieties—Powderpuff Chinese Crested Dog (with hair) and Hairless Chinese Crested Dog. Chinese Crested Dogs stand 11 to 13 inches tall and weigh between 6 and 12 pounds. This small, fine-boned dog has a tapered muzzle, almond-shaped eyes, and large, erect ears. The Hairless Chinese Crested Dog variety has hair on the head and crest of the neck, the feet, and the tail. When running, with the coat flowing behind them, they look like tiny horses. The Powderpuff Chinese Crested Dog variety has a normal coat of long, silky guard hairs over a silky undercoat. Grooming the Hairless Chinese Crested Dog consists of bathing the dog, using moisturizers on the hairless skin to keep it healthy, and applying sunscreen to prevent sunburn. The Powderpuff requires twice weekly brushing to prevent tangles and mats. The Chinese Crested is not overly active but does enjoy walks and playtimes. He does well in agility but also likes to cuddle. 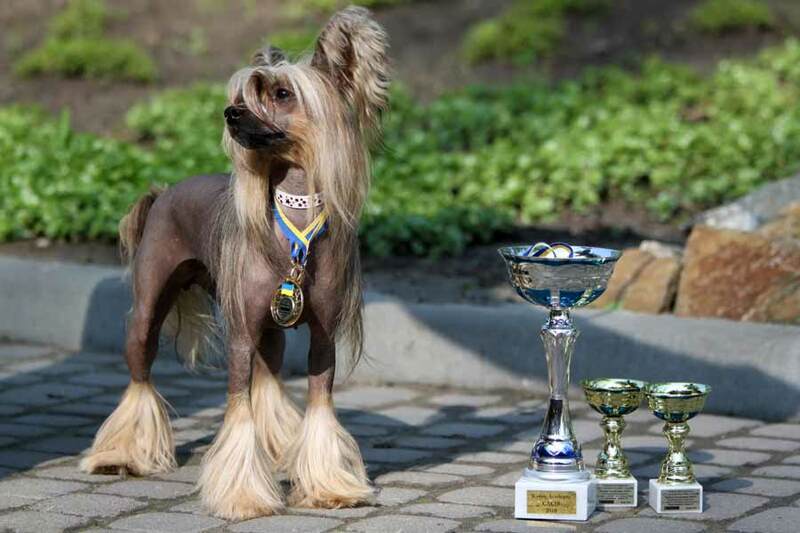 The Chinese Crested Dog enjoys therapy dog work, and although the Powderpuff will be eagerly petted, the Hairless Chinese Crested Dog will always create conversation. As with all toy breeds, during therapy dog visits, these dogs should be protected from hard hugs that might injure the dogs. As with many toy breeds, it is very easy to spoil Chinese Cresteds, so early training is a good idea. With puppy training and socialization classes, the dog learns how to learn, is introduced to the basic commands, and gets to meet a variety of people and other puppies. In addition, the dog owner learns how to teach her dog and establish household rules. 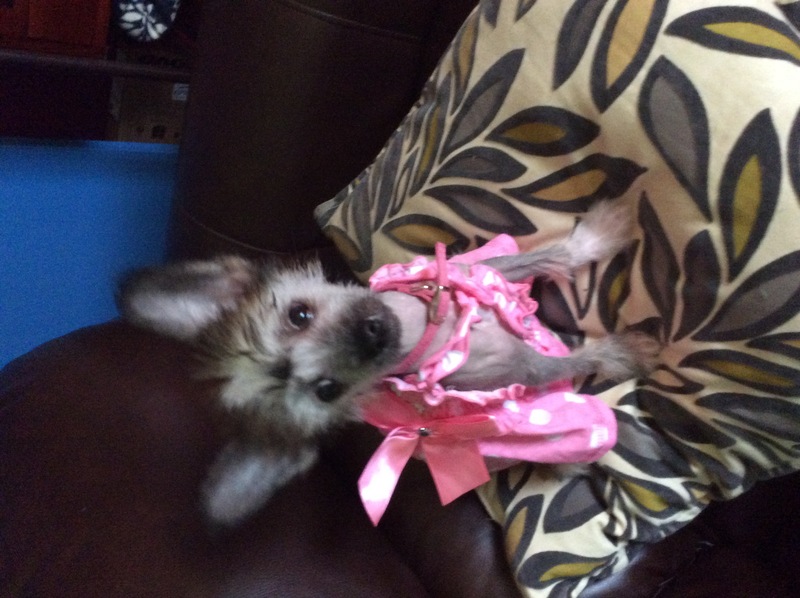 Housetraining the Chinese Crested Dog can be a challenge. However, this dog breed is very clean, and with patience and consistency, housetraining will happen. The Chinese Crested Dog makes a wonderful companion for many different people. If you are active and want to do agility, he can do that. He can also be a terrific pet for a housebound senior. He is good with older children as long as they treat him with respect. He is too small for very young kids, and many breeders will not sell Chinese Crested Dog puppies to families with young children for this reason. When well-socialized, he is good with other dogs, although playtimes should be carefully supervised. The Chinese Crested is small, but he doesn’t realize that he is small, and could be hurt by a larger dog. The Hairless Chinese Crested Dog variety can have jaw and dental problems, including malformed teeth and early tooth loss. The breed can also have liver and eye problems. Share your Chinese Crested Dog story. Note: Upload only Chinese Crested Dog picture or your picture with Chinese Crested Dog below - spammer's ip may be blocked. The Chinese Crested is fine-boned, elegant, and graceful — and certainly unique-looking. High-spirited and happy, animated and agile, he is an adept climber and jumper who often grips his toys (or his owner’s neck) tightly with his paws. This people-oriented “Velcro” dog depends emotionally on his owner and demands a lot of personal interaction, stroking, and rubbing. He doesn’t like being left for long without companionship. Reserved with strangers, some lines or individuals are high-strung and/or timid with new people and new situations. Early and frequent socialization will help build a confident, stable temperament. Chinese Cresteds are playful with (though sometimes jealous of) other pets. Though independent and somewhat willful, he is also bright and responds well to the obedience training he needs to control his inquisitive activities. Use reward-based methods. Some will bark (or howl), and some are clever escape artists who can scale high fences or dig under them. Housebreaking is very difficult, especially when a male is not neutered, as this somewhat primitive breed is inclined to excessive marking of his territory (i.e. lifting his leg in your house).